As the the planet has completed another revolution around the sun, it is once again time for Shulcoth! This celebration in song and comedy pays tribute to the dearly departed, unrepentant force of nature known as Citizen Kafka, a.k.a. Richie Shulberg. Edward Haber and Kenny Kosek and a cast of dozens of characters joined Irene in celebration of the Citizen. It's time to have fun today! Mmmmnnnn... Doc Otto's Rat's Milk Cheese! Groucho, sounds like you've properly prepared for tonight's show! BAI really attracted the cream of callers. You aren't Z100 or WBAI! "Commie Nudie" called in hourly. I'm over here, sitting in the VW Bus at Wetlands. Ah, the Secret Museum of the Air. One of my favorite WBAI programs. I think I lost track when it moved to WFMU, so I have some archive-diving to do! This is a variation on the "we never play in G" bit, for those who may need to hit Irene's previous Shulcoth archives. was citizen kafka into negativland? I don't think so, Toni. Two different worlds. I'd say the Kafka Radio show was more like Firesign Theatre than Over The Edge. I forgot about this charming number! I am only aware of CKafka via yr show, Irene. It be a hoot. 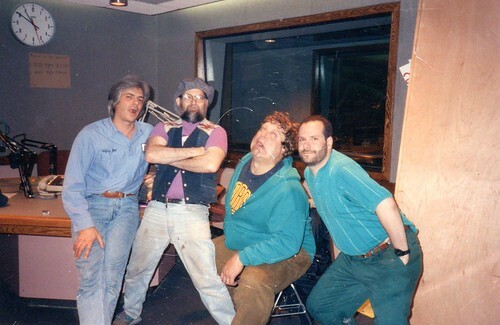 I remember Citizen Kafka back in the early 1990s on WBAI… Back when that station was a tad more less crazy. Oh man, Hadassah… If “JM in the AM” were still on the air, I would suggest Tzedakah boxes for that show and the station. Do you think that Richie would have been surprised that his pals and fans would come together like this every year after his passing, or would he have expected it? Mann, McMahon, spelling is fun, too crazy. I love it! When Kafka was liquidating his storage rooms, I found a few of those PSAs, and tried to buy them, but he wanted to copy them first! "I'm a man, a Baldwin or-gan"
Herb, they are not really fans of the humor but like the music more now. Petticoat Junction in pop media Hell now mentions Trump! Petticoat junction! My fave of faves! Thank you! no probs @Herb, I had to google it. It was on the tip of my tongue too. that Holy Modal Rounders tune is Bay Rum Blues.